Today I want to show you how to save your fingertips from that menace that is the stubborn safety eye! As you know I recently bought some safety eyes, but with these ones came washers that I had never seen before (shown in the picture). As I tried them out I became really frustrated with the washers because they are really hard to put on. I decided that they weren't going to ruin my amigurumi making and so I set myself up to find an easy way to put them on! 1. 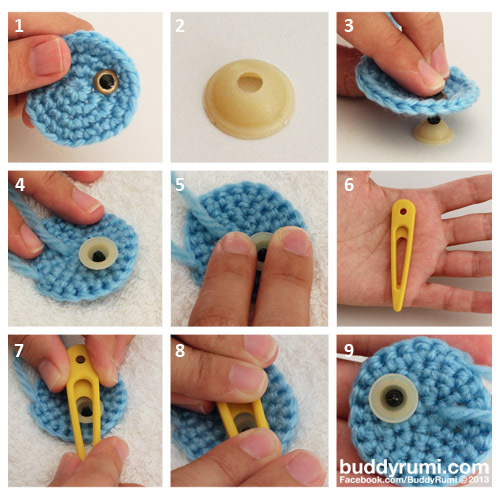 Place the safety eye in your knitted/crochet piece as usual. 2. Place the washer flat side down on a hard surface. 3. Place the post of the safety eye into the opening of the washer. Press down until you hear a click. You can use a towel between your finger and the safety eyes so that your finger doesn't get hurt. 4. Flip the whole thing and place a thick towel between the eye and the hard surface, that way the eye doesn't get scratched. 5. Place your index and middle fingers, one on each side of the washer, and press down until you hear several clicks and the washer doesn't move anymore. 6. If you still hurt your fingers in step five, instead use an object that is hard, bigger than the washer and has an opening in the middle to allow the washer to move downwards. I use a plastic piece that protects the blades of a scissor. 7. Place your object on top of the washer aligning the opening with the post of the safety eye.